It’s possible you’ve never heard of the classic Raspberry-Lime Rickey. But this is one refreshing drink you want to get to know. The makers of famous Tower Root Beer, have come up with the perfect classic take on a New England summer favorite, the Raspberry Lime Rickey. Enjoy one of these delicious beverages today! "All The Way From Massachusetts"
The Raspberry-Lime Rickey is one of those rare drinks that’s excellent with or without alcohol. Leave as is for a great non-alcoholic treat or add vodka. Gone for 30 years, the family of Domenick Cusolito, has resurrected the old family recipe of this Boston Root Beer. 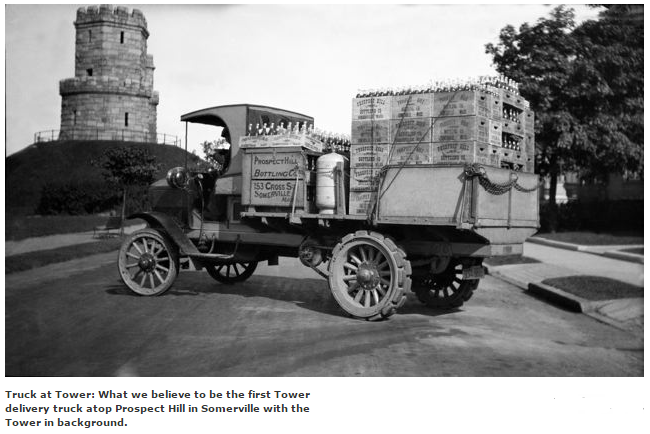 Prospect Hill Beverages, LLC has brought back Tower Root Beer to the New England area using the original family recipe bottled and distributed by Prospect Hill Bottling and Soda Water Co. Tower Root Beer was first established in Somerville, MA in 1914 by Domenick Cusolito who immigrated to the United States from Salina, Italy and settled in the Boston area. After World War II, his sons, Jack, Richard and Paul, assumed the responsibility for the management and operation of the family business. Now, Mr. Cusolito's grandson Larry and grand daughters Carolyn and Judy head up a third-generation of the family that has reintroduced the Tower Root Beer brand in the New England region and re-established the Cusolito family tradition in the soft drink market.